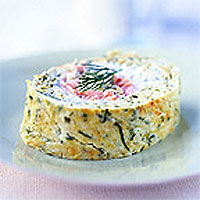 This dish looks very pretty with the pale, flecked green roulade enclosing a filling of creamy fromage frais, herbs and pink smoked trout. Try it as a centrepiece for a summer buffet or slice and serve as an elegant first course with a little fresh tomato sauce. First make the roulade. Drain the La Faisselle Fromage Frais in a lined sieve for 1 hour. Toss the courgettes with 1 tsp salt and place in a colander for 1 hour. Preheat the oven to 190°C, gas mark 5. Butter a large Swiss roll tin, about 33 x 25cm, then line it with butter and baking paper. Rinse the courgettes, then squeeze out all the excess moisture. Melt the butter in a frying pan and cook the onion or shallots gently for 6-8 minutes, until softened, then stir in the courgettes. Cook over a medium heat, tossing frequently, for 4-5 minutes. Season well, cool, then stir in the parsley, fromage frais, Parmesan, breadcrumbs and egg yolks. In a clean bowl, whisk together the egg whites and cream of tartar until stiff. Gently fold the egg whites into the courgette mixture, using a large metal spoon and trying to keep as much air in the mixture as possible. Turn into the prepared tin, smooth until level and bake for 15-20 minutes or until the centre of the roulade is just firm. Place a clean tea towel on the work surface and cover with a new sheet of baking paper. Turn the roulade onto the fresh paper, remove the lining paper and trim the edges. Loosely roll up the roulade, like a Swiss roll, with the new paper inside. Cool, then unroll gently. To make the filling, beat the drained fromage frais with a wooden spoon until smooth, adding creamed horseradish to taste. Beat in the herbs. Spread the fromage frais mixture on top of the roulade, then cover with the flaked trout. Using the tea towel and paper, roll up the roulade again, this time without the paper inside. Turn onto a serving platter and garnish with dill sprigs. Cut into thick slices to serve.